As a business owner, you'll be asking yourself "How much money is my business making?" With taxes, discounts, refunds, late payments, and unpaid invoices, the answer to this question can be tricky. We've built the Finance Summary report to quickly answer this question. This article will walk you through each of the key definitions for this report. Why don't my sales and payments match? To access the Finance Summary report, from the left-hand Navigation Menu, head to Analytics > Reports > Finance Summary. 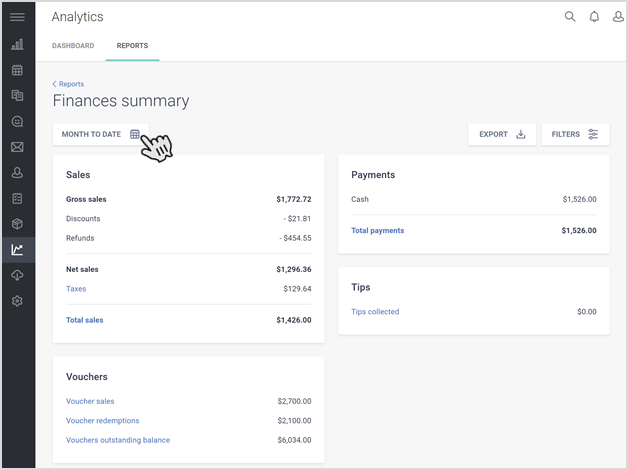 By default, the Finance Summary report will show you your consolidated financial metrics for the Month to Date (that is, the month so far). You can adjust the date range to whatever custom range you like. NOTE: If you have multiple locations, you can Filter the Finance Summary view for any particular branch or outlet. By default, the Finance Summary report will show you consolidated metrics across all business locations. The first portion of your Finance Summary report shows a summary of your sales activity for your selected period. The sales summary is based on invoices that were created during this time period. It is important to note that all invoices raised during the time period are included in these figures, regardless of whether the invoices are unpaid or part paid. Gross Sales: Shows the total value of all invoices raised during the time period, including Discounts and Refunds. The Gross Sales metric does not include invoices raised for vouchers, which are accounted for separately. Net Sales: Shows the value of your sales, after deducting discounts, refunds, and taxes. Net sales corresponds to your business's revenue. Total Sales: Shows the value of your sales after deducting discounts and refunds, and including taxes. We will further show how discounts, refunds, and taxes are broken down. It's also important to note that if your tax settings are set to inclusive, then your listed discounts and refunds will automatically be tax adjusted as well. From the Sales Summary report, you can click on Taxes to view your Taxes Summary report, or on Total Sales to see your Sales by type report. Your payments summary report allows you to track payments you've received from sales and vouchers. 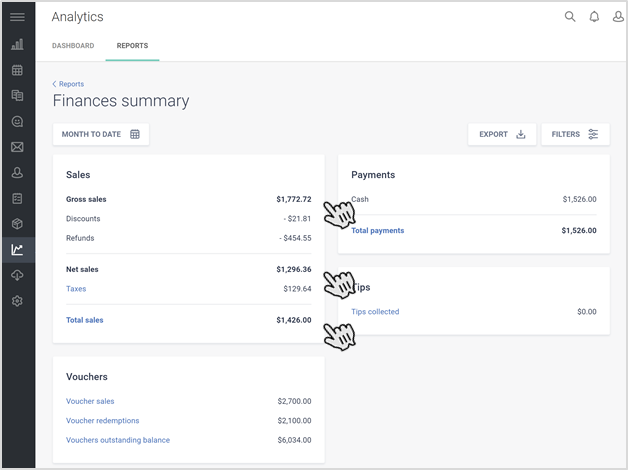 You can customize how this report is displayed by Creating Payment Types that reflect the most common payment methods from your users. Voucher outstanding balance: The total value of all unexpired vouchers that have not yet been redeemed. We've created an article on How Vouchers Show Up in Reports to provide further explanation on this topic. 5. Why don't my sales and payments match? Unpaid Invoices: If you generate an invoice, but did not receive payment during the same time period, your Total Sales will be higher than your Total Payments. You can use your Sales log report to track part paid and unpaid invoices. Tips: Tips are included in payments calculations, but are not included in sales. This is because Tips are not considered to be part of a business's revenue under most accounting standards. TIP: In order to quickly make sense of your finance summary, it is recommended to complete and checkout appointments as soon as your client's service is completed. This will make sure your sales and payments match, and help you easily keep track of your unpaid invoices.